Good thing I left this decal alone - it is well-preserved, wouldn't you say? Those feet, though... I have some potential replacements knocking about in a drawer around here; I'll give it a try soon and let you all know how it goes. ...and here, upside down. Looks pretty good to me :-). Ideally I would locate some car wax to really clean and polish it, but we're not doing too badly with just a bit of elbow grease. I saw one of these at an antique mall a few months ago. They wanted $75 and I was VERY tempted, but decided to buy a Remington Quiet-Riter (1950) at the same store for $35 instead. My purchase is a good, solid typer but has nowhere NEAR the beauty of your Noiseless. What a lovely machine! It's a typewriter that's already been on my wish list for a long time, too. Due to my restrictions, only with case and not too expensive, I havent't got to find any so far. 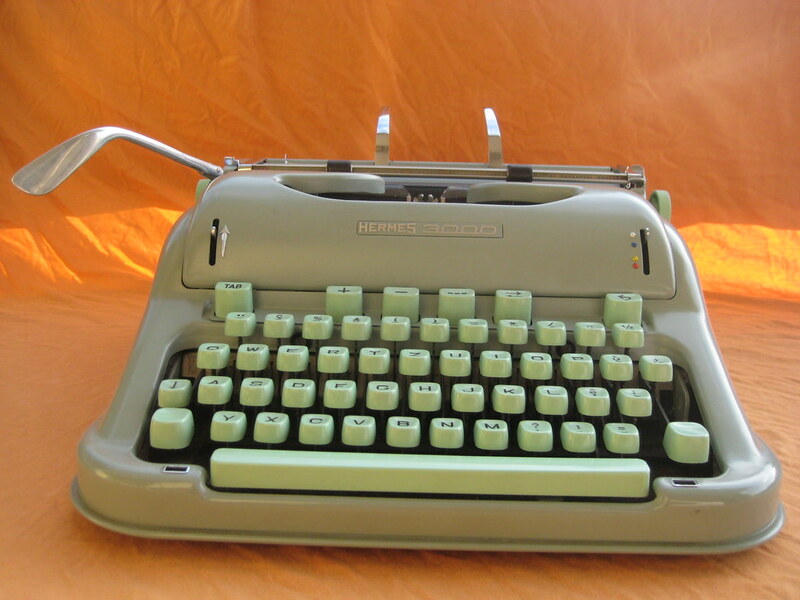 It was one of these sleek beasts that got me hooked on typewriters, too. 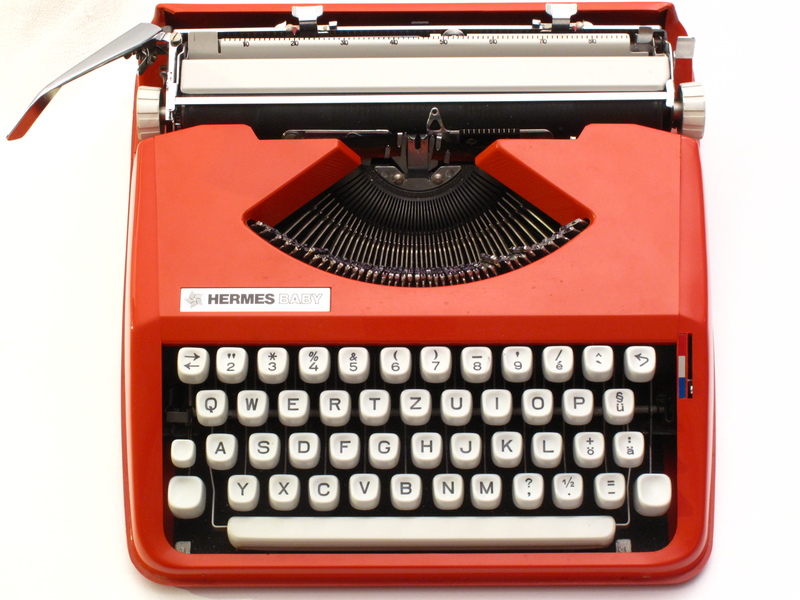 I always had used typewriters--a 70s Olympia in college, a borrowed Lettera 32, and, when that was repossessed, a borrowed Skyriter, later on. But when I came upon a good-condition Noiseless No. 7, with its case, in a flea market, I thought it was the most beautiful thing I had ever seen. I took it home for $40. Turned out to be from 1934. Mine also skips on the 'a.' (Why the 'a' is one of the great existential questions of typewriterdom.) But I don't care. I have published two books and both started in life on the Noiseless No. 7. I hope you keep using that beautiful machine! This one is also on my list, but keeps getting delayed as it is relatively common on U.S. ebay. I bid on a Noiseless 8 (the big, chunky Deco version) this week and didn't quite get there. I've looked at the auction descriptions of at least 100 of these over the last few months and only recall a couple having type samples. Ah, well. Again, beautiful photos. They will probably drive up the market value as people do online research. FYI: just noticed a cool thing ... to make room for the extra keys needed for accents and the pound/dollar signs, your typewriter's backspace and margin release keys have been relocated above the keyboard with, I assume, special slots cut through the bakelite cover. Very cool! you really seem to have great luck with getting good machines. I love watching the action on these. I've got one of these, too! Lucky is his name, as in "lucky find." It's a crinkle-finish machine, so it didn't clean up as well as yours, but even chipped and faded and missing one of those little spring-loaded feed rollers on the front, it's a neat machine. I do feel like I need to type slower, though perhaps that's just due to the mechanism. I long since sorted out his jumping-carriage issue (a dangling bit of spring that tripped the release.) Now Lucky is a sometimes-typer when I need to marvel at mechanical ingenuity. @Cameron: I expect it won't be too long before you come across another; there seem to have been many of these sold in the U.S.
@RN: What a great story! I'm glad you have one too and enjoy using it, skipping a's and all. As for your second comment - indeed you're right! I had assumed the American versions had the same layout, but after looking at a few more pictures I see that is not the case. This layout works fine; it is just a bit odd having the backspace key on the left, though. Congratulations, it's beautiful. 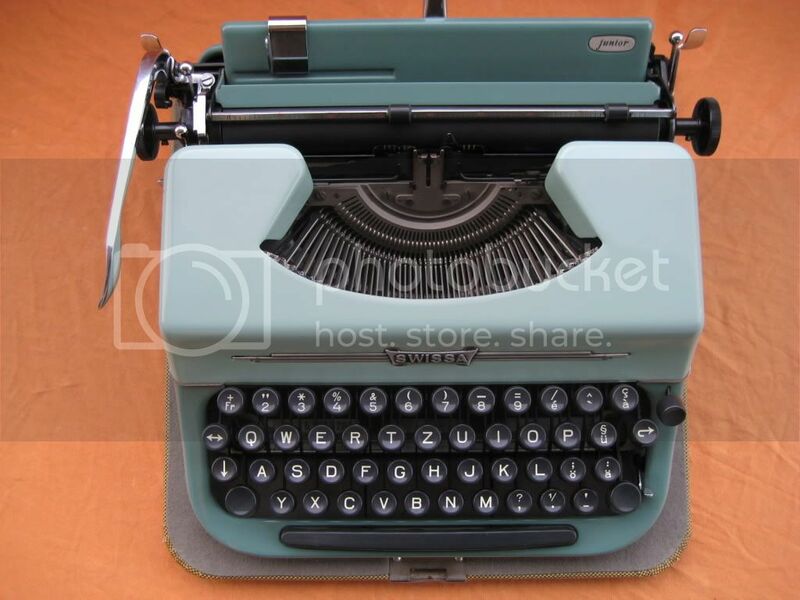 And yes, a RNP7 was my first typewriter and would be the last one I'd abandon, for sentimental reasons. My typeface is just like yours. It's a bit more rounded and soft than the usual typefaces. I fixed the skipping issue on my machine but honestly can't remember how (this was a few years ago). I think it's a matter of cleaning the escapement and perhaps adjusting it slightly. Glad you have gotten a Noiseless Model 7! Great review. I was amazed when I got mine at the engineering of the typebar angles as you pointed out. These machines are works of wonder. Mine will not look nearly as nice as yours since it has the black ribbon cover knobs, no decal on the paper tray, and wrinkle finish black paint. My wish list includes a shiny black one with the chrome knob ribbon covers and -- yes there was one made -- glass keys. Flattening pringled ribbon covers on the Underwood may be a lost cause. They'll never be as flat and shiny as pre-war metal ones. Tempted to send you new feet, or at least the makings thereof. She looks a little down at heel. ...and if you really have to get a machine without a case, this could be the ideal machine. Sturdy! It *is* a lovely bit of design work. I held out for an early one with the large 7 on the paper tray, like yours. When I got it, the paper tray decals were faded to practically silver. So I got a gold leaf paint marker from a craft store and slooowly, caaaarefully filled in the lettering. If you go that route, I suggest practicing with the pen on something else, because it takes a bit of experience to apply evenly. @Richard: Thanks! I knew you would approve ;-) I'll do a bit of gentle cleaning in the general area of the escapement and see if it improves things, but it's not too bad really. The "a" is triggered maybe 20% of the time, which does not detract from using the machine. @Fernando: I hope it won't take too long, either, even on eBay Germany! You might be pleasantly surprised one of these days; I'll let you know if I come across one in my internet wanderings. @Rob: Thanks so much for offering to send me new feet! The Noiseless has been re-shod, and I'll put up an update later today. The new feet, being round, are historically inaccurate. But they work. @MOLG: And speaking of historical inaccuracies, thanks for the hint about the gold leaf marker! I have put one into my basket on eBay, but I'll take a look locally to see if they have a good equivalent to Krylon here. Glad to hear you have tried it and gotten good results! That was exactly my first thought too, but then I was dissuaded when advised I had to make a historically accurate decal... that sounds like a lot of work! This would be a lot better. @Matt: Don't worry, I think I finally learned my lesson this time :) Besides, with a gold leaf marker and steady hands, perhaps I can carry out some amateur restoration in any case... knock on wood. It's relieving to know I'm not alone with the skipping issue. Now if only someone could get Richard to remember EXACTLY how he fixed his, so he could share with us.